Hat Yai is one of the most visited city in Thailand. It takes only about 1 hour flight from klia2 to Hat Yai International airport, via AirAsia. AirAsia is running a zero fare promotion to Hat Yai for only RM 41.00 one way. I took advantage of the offer in January 2016 and My return flight to Hat Yai cost me RM144.00. The fare inclusive of two set of Martin Yan’s Longevity Noodles, inflight meal. There are many way to get to the City from airport. 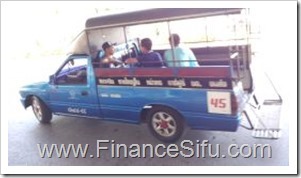 If you are on Budget, do consider taking the Public transport service called "Song-Teaw". "Song-Teaw" is a blue high roof truck. This mode of transportation was mainly used by the locals and a bit cramp. The "Song-Teaw" waiting area is located at the car park, outside the arrival terminal and it takes 3 minutes walk. The fare to Hat Yai city is THB 30 Bath. You pay the fare to the driver after you disembark. It’s recommend to choose hotel near to the Kim Yong Shopping Center aka Kim Yong local Market. From the Kim Yong Shopping Center, you can walk about 5 minutes to the famous Lee Gardens Plaza Hatyai. The "Song-Teaw" will stop opposite the Kim Yong Shopping Center. Since this’s my first visit to Hat Yai, I get the help of the local people to remind me the exact stop. I stayed for 2 nights in Hat Yai city, before heading to Koh Lipe. I took the same "Song-Teaw" to the Hat Yai International airport. A Walk Around Walking Street Hat Yai, Thailand. Thai Street Food and Shopping in Hat Yai. This is Walking Street in Hat Yai, Thailand. It’s an area with loads of shops, shopping centres, restaurants and street food and there is also a street market there. Additionally It’s home to two of the finest Hat Yai hotels, the Lee Gardens Plaza Hotel and the Grand Plaza Hotel. It’s well worth exploring this area and the surrounding streets, especially if you’re in the market for some Thai food, or shopping. If you love Thai Street Food, Thai restaurants or shopping be sure to visit Walking Street Hat Yai. Thai street food is everywhere in Thailand, you’ll find it from Bangkok to Pattaya to Phuket and everywhere in between. It’s cheap and it is really delicious! At markets like this all the food is cooked fresh, as they sell it, and as I mentioned, it is delicious! Street food is some of my favourite Thai cuisine, and there is so much variety of street food in Thailand! Thai Street Food is a must to try if you’re on holidays in Thailand. Thailand food markets are one of the best places to buy fresh and authentic Thai food, or to buy groceries and fruit while you travel in Thailand. There are so many Thai dishes on offer and the foods here are cheap, and so tasty! And in case you’re worried, eating street food is perfectly safe. It’s what the locals eat and it is cooked fresh and sold quickly. I’ve been eating it for 4 years in Thailand and my friends who have been to visit and tour Thailand have all eaten it, and none of us have had any problems. Thai street food is some of the best Thai food you’ll find in Thailand! The markets in Thailand are a great place to get an insight into Thai culture while you travel in Thailand. You can shop alongside the locals and learn what they buy and eat. And the markets are a great place to try traditional Thai street foods, learn Thai recipes and cooking, as well as eat some of the best Thai dishes in Thailand. You’ll see the people cooking the food right in front of you. And best of all, the food is cheap, often much cheaper than eating in a Thai restaurant. Eating at markets is a good way to eat cheap on your Thailand holidays. This entry was posted on Tuesday, June 21st, 2016 at 4:13 am	and is filed under Travel. You can follow any responses to this entry through the RSS 2.0 feed. Both comments and pings are currently closed.